So, I feel like I haven't shown my face 'round these parts in a minute, so here's a little outfit post I conjured up for ya. *smile* Everything but two items in this post are fairly old. The colorful dress is by XOXO and I bought it off of Amazon for a steal at 13 bucks a couple months back. It's still for sell, but for a higher price from another seller. Ah well. The jacket I've had forever as well. The two new items in this post are the new infinity scarf from Old Navy (that I adore), and the black leather satchel (that I also adore maybe more than the scarf) from Nine West. Let me just say this...I have NEVER been one of those huge satchel/shopper/tote carrying kind of girls. This right here is my very first "tote" bag and I am now officially an old lady a convert. I love that I can fit EVERYTHING in this thing--my stuff, kid stuff, diapers, my camera, etc. Did I mention, that I've also thrown in my MacBook from time to time?? I knew I wanted a large bag, and the only bags I would consider were bags that also had a long strap to wear over the shoulder or "crossbody style" and this fit the bill. The leather is heavy and of excellent quality as well. I've never purchased bags from Nine West before, and I have to say that I'm impressed. The price was pretty reasonable to me at $199 (it's on sale for $139 now!). It's not cheap--but it also won't cost you what a Michael Kors, Coach, etc. would be either. I'm all for happy mediums! By the way, I must give Melissa of Melissa's Sweet Style a shout out because I saw this purse in one of her style posts which is what caused me to go looking for it online. I love that look! The dress is super cute, & I adore the lace detail on the baxk! Nice outfit, Nik! I need the deets on that lipstick! Thanks Candice!! It's Wet n Wild MegaLast lip color in Cherry Bomb (918D). You can see it HERE! You are seriously too fabulous! Love everything about this look! I've always been hesitant to order clothes from Amazon and now I'm going to reconsider. Cute as always! 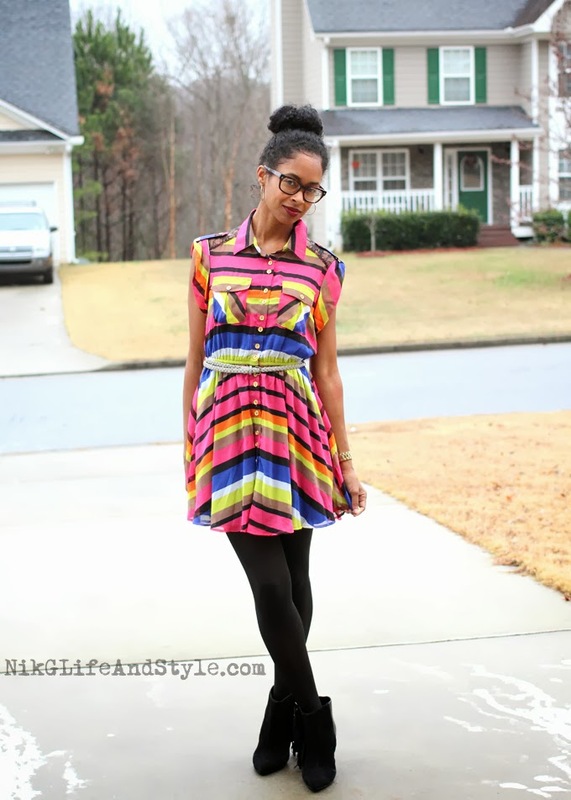 the dress is so colourful and fun! I like the surprise lace panel at the back PLUS it was only $13. steal!! the boots are great too, I'm a sucker for fringe! Too Cute and you make me miss my hair! I just got it cut last month and I miss my bun! Oh well. Happy hump day! That dress just puts a smile on my face. I love colours...very cute! You look adorable.